The German-born American sculptor Richard Lippold (1915-2002) began his career in industrial design. It was in 1942 that he devised the form of expression that made him famous in the United States: linear sculpture, organising space in a mesh of brass, nickel or copper wire, widening from opposing poles and creating three-dimensional geometric figures. His work is represented in all the great American museums as well as in public buildings like the Lincoln Center and San Francisco Cathedral. 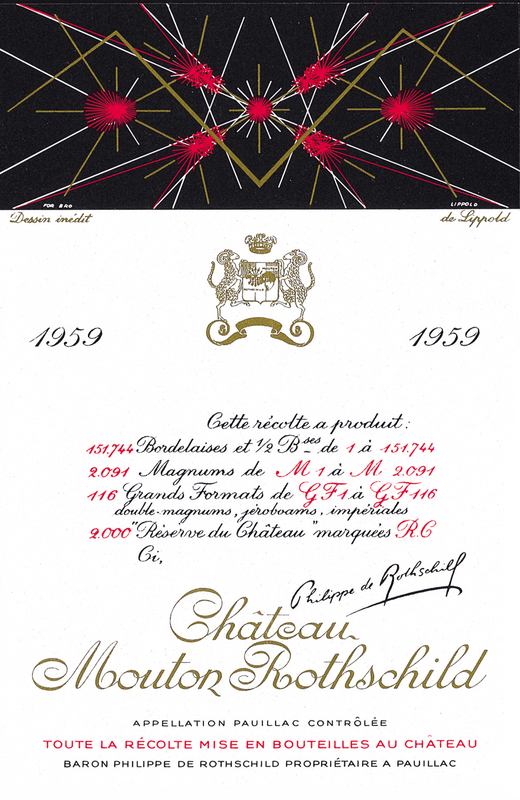 For the Mouton Rothschild label for 1959 he has managed to translate into his own abstract language the colour of the wine and the alignment of the vines.